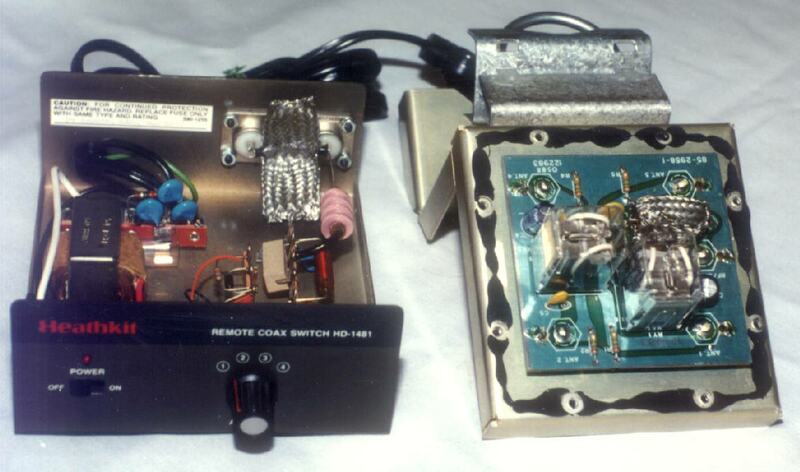 The usefulness of the Heathkit HD-1481 remote coaxial switch can be increased with this modification to allow its operation up through two meters. The only material required is six inches of shielding braid from approximately half inch diameter cable and electrical tape. Using this to shield several critical components reduces reflections caused by the switch. In the control box, capacitors C106 and c107 should be spread apart and shielded with the braid as shown int the photograph. Care should be exercised not to short the braid to either the capacitor leads or to ground. In the remote relay box, C1 and L1 must both be shielded. One leg of L1 must be removed from the circuit board; L1 is then wrapped with electrical tape to insure that the shield doesn't shot anything out. Over the electrical tape the braid is placed and the edges are soldered so that the braid fits snugly. After this the leg of L1 is resoldered. There is a hole in the circuit board beneath L1; a wire is inserted through it and up to the shield on L1; it is soldered in both places, thus grounding the shield. Capacitor C1 is covered with braid and the braids covering C1 and L1 are soldered together. Care must be exercised to insure that the shield doesn't ground either lead of C1 or of L1. Photo of the finished modification. Click on the photo for a larger picture. With these modifications the reflections caused by inserting the remote coax switch in the line should result in a VSWR less than 1.5:1 with a 50 ohm dummy load connected in place of the antenna. This should be checked before the switch is used. If you have questions, my email address is my first name "dot" my last name "at sign" wallawalla "dot" edu.